A business telephone system is a multiline telephone system typically used in business environments, encompassing systems ranging from the small key telephone system (KTS) to the large private branch exchange (PBX). A key telephone system was originally distinguished from a private branch exchange in that it did not require an operator or attendant at the switchboard to establish connections between the central office trunks and stations, or between stations. Technologically, private branch exchanges share lineage with central office telephone systems, and in larger or more complex systems, may rival a central office system in capacity and features. With a key telephone system, a station user could control the connections directly using line buttons, which indicated the status of lines with built-in lamps. Key telephone systems are primarily defined by arrangements with individual line selection buttons for each available telephone line. The earliest systems were known as wiring plans and simply consisted of telephone sets, keys, lamps, and wiring. Key was a Bell System term of art for a customer-controlled switching system such as the line-buttons on the phones associated with such systems. The wiring plans evolved into modular hardware building blocks with a variety of functionality and services in the 1A key telephone system developed in the Bell System in the 1930s. Key systems can be built using three principal architectures: electromechanical shared-control, electronic shared-control, or independent key sets. New installations of key telephone systems have become less common, as hybrid systems and private branch exchanges of comparable size have similar cost and greater functionality. A typical rotary dial key telephone: the Western Electric eighteen-button Call Director, manufactured from 1958 to the early '80s. Before the advent of large-scale integrated circuits, key systems were typically composed of electromechanical components (relays) as were larger telephone switching systems. The systems marketed in North America as the 1A, 6A, 1A1 and the 1A2 Key System are typical examples and sold for many decades. The 1A family of Western Electric Company (WECo) key telephone units (KTUs) were introduced in the late 1930s and remained in use to the 1950s. 1A equipment was primitive and required at least two KTUs per line; one for line termination and one for station (telephone instrument) termination. The telephone instrument commonly used by 1A systems was the WECo 300-series telephone. Introduced in 1953, 1A1 key systems simplified wiring with a single KTU for both line and station termination, and increased the features available. As the 1A1 systems became commonplace, requirements for intercom features grew. The original intercom KTUs, WECo Model 207, were wired for a single talk link, that is, a single conversation on the intercom at a time. The WECo 6A dial intercom system provided two talk links and was often installed as the dial intercom in a 1A1 or 1A2 key system. The 6A systems were complex, troublesome and expensive, and never became popular. The advent of 1A2 technology in the 1964 simplified key system set up and maintenance. These continued to be used throughout the 1980s, when the arrival of electronic key systems with their easier installation and greater features signaled the end of electromechanical key systems. Two lesser-known key systems were used at airports for air traffic control communications, the 102 and 302 key systems. These were uniquely designed for communications between the air traffic control tower and radar approach control (RAPCON) or ground control approach (GCA), and included radio line connections. Automatic Electric Company also produced a family of key telephone equipment, some of it compatible with Western Electric equipment, but it did not gain the widespread use enjoyed by Western Electric equipment. With the advent of LSI ICs, the same architecture could be implemented much less expensively than was possible using relays. In addition, it was possible to eliminate the many-wire cabling and replace it with much simpler cable similar to (or even identical to) that used by non-key systems. Electronic shared-control systems led quickly to the modern hybrid telephone system, as the features of PBX and key system quickly merged. One of the most recognized such systems is the AT&T Merlin. Features could be added or modified simply using software, allowing easy customization of these systems. The stations were easier to maintain than the previous electromechanical key systems, as they used efficient LEDs instead of incandescent light bulbs for line status indication. LSI also allowed smaller systems to distribute the control (and features) into individual telephone sets that don't require any single shared control unit. Generally, these systems are used with a relatively few telephone sets and it is often more difficult to keep the feature set (such as speed-dialing numbers) in synchrony between the various sets. Into the 21st century, the distinction between key systems and PBX systems has become increasingly blurred. Early electronic key systems used dedicated handsets which displayed and allowed access to all connected PSTN lines and stations. The modern key system now supports SIP, ISDN, analog handsets (in addition to its own proprietary handsets - usually digital) as well as a raft of features more traditionally found on larger PBX systems. Their support for both analog and digital signaling, and of some PBX functionality gives rise to the hybrid designation. A hybrid system typically has some call appearance buttons that directly correspond to individual lines and/or stations, but may also support direct dialing to extensions or outside lines without selecting a line appearance. The modern key system is usually fully digital, although analog variants persist and some systems implement VOIP services. Effectively, the aspects that distinguish a PBX from a hybrid key system are the amount, scope and complexity of the features and facilities offered. Hybrid systems are a common tool in the financial services industry used on trading floors. These advanced hybrid key systems generally only require attached PBXs for interaction with back-office staff and voicemail. These systems commonly have their front end units referred to as Turrets and are notable for their presentation of hoot-n-holler circuits. Multiple Hoots are presented to multiple users over multiplexed speakers to multiple locations. A private branch exchange (PBX) is a telephone exchange or telephone switching system that is installed at, and serves, a private organization with a large number of internal devices. When two devices inside the organization need to be connected, the switching to make this connection is done internaly by the private branch exchange. When an internal device needs to be connected to an external device, it connects to the external public switched telephone network. The number of lines from the organization to the public switched telephone network is greatly reduced, often by a factor of 10 or more, e.g. instead of 1 000 lines there only 50. Each device connected to the PBX, such as a telephone, a fax machine, or a computer modem, is referred to as an extension. There are two numbering plans to designate extensions on a private branch exchange. In the first numbering plan the PBX maps one-to-one with the numbering plan of the public switched telephone network, e.g. the PBX is assigned all numbers 234-5000 to 234-5999 (1000 devices), and the public switched telephone network treats it as a normal internal switching exchange. In the second numbering plan, the PBX is assigned a few public switch telephone network numbers, and the device is designated a second "extension" number, e.g. 234-5678 ext 1234(5). Internally only the extension number is used to connect two internal devices. To connect an internal device to an external device a specific single digit is designator, e.g. 9, which reduces the number of internal extension numbers by 10%. Initially, PBX systems offered the primary advantage of cost savings for internal phone calls: handling the circuit switching locally reduced charges for telephone service via central-office lines. As PBX systems gained popularity, they began to feature services not available in the public network, such as hunt groups, call forwarding, and extension dialing. From the 1960s a simulated PBX known as Centrex provided similar features from the central telephone exchange. A PBX differs from a key telephone system (KTS) in that users of a key system manually select their own outgoing lines on special telephone sets that control buttons for this purpose, while PBXs select the outgoing line automatically. The telephone sets connected to a PBX do not normally have special keys for central-office line control, but it is not uncommon for key systems to be connected to a PBX to extend its services. A PBX, in contrast to a key system, employs an organizational numbering plan for its stations. In addition, a dial plan determines whether additional digit sequences must be prefixed when dialing to obtain access to a central-office trunk. Modern number-analysis systems permit users to dial internal and external telephone numbers without special codes to distinguish the intended destination. 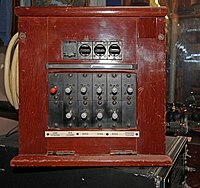 The term PBX originated when switchboard operators managed company switchboards manually using cord circuits. As automated electromechanical switches and later electronic switching systems gradually replaced the manual systems, the terms private automatic branch exchange (PABX) and private manual branch exchange (PMBX) differentiated them. Solid-state digital systems were sometimes referred to as electronic private automatic branch exchanges (EPABX). As of 2016[update], the term PBX is by far the most widely recognized. The abbreviation now applies to all types of complex, in-house telephony switching systems. Two significant developments during the 1990s led to new types of PBX systems. One was the massive growth of data networks and increased public understanding of packet switching. Companies needed packet-switched networks for data, so using them for telephone calls proved tempting, and the availability of the Internet as a global delivery system made packet-switched communications even more attractive. These factors led to the development of the voice over IP PBX, or IP-PBX. The other trend involved the idea of focusing on core competence. PBX services had always been hard to arrange for smaller companies, and many[quantify] companies realized that handling their own telephony was not their core competence. These considerations gave rise to the concept of the hosted PBX. In wireline telephony, the original hosted PBX was the Centrex service provided by telcos since the 1960s; later competitive offerings evolved into the modern competitive local exchange carrier. In voice over IP, hosted solutions are easier to implement as the PBX may be located at and managed by any telephone service provider, connecting to the individual extensions via the Internet. The upstream provider no longer needs to run direct, local leased lines to the served premises. The PBX's internal switching network. Since the advent of Internet telephony (Voice over IP) technologies, PBX development has tended toward the IP PBX, which uses the Internet Protocol to carry calls. Most modern PBXs support VoIP. ISDN PBX systems also replaced some traditional PBXs in the 1990s, as ISDN offers features such as conference calling, call forwarding, and programmable caller ID. As of 2015 ISDN is being phased out by most major telecommunication carriers throughout Europe in favour of all-IP networks, with some expecting complete migration by 2025  Originally having started as an organization's manual switchboard or attendant console operated by a telephone operator or just simply the operator, PBXs have evolved into VoIP centers that are hosted by the operators or even manufacturers. For the option to call from IP network to the circuit-switched PSTN (SS7/ISUP), the hosted solutions include interconnecting media gateways. Historically, the expense of full-fledged PBX systems has put them out of reach of small businesses and individuals. However, since the 1990s many small, consumer-grade and consumer-size PBXs have become available. These systems are not comparable in size, robustness or flexibility to commercial-grade PBXs, but still provide many features. The first consumer PBX systems used analog (POTS) telephone lines, typically supporting four private analog and one public analog line. They were the size of a small cigar box. In Europe these systems for analog phones were followed by consumer-grade PBXs for ISDN. Using small PBXs for ISDN is a logical step, since the ISDN basic rate interface provides two logical phone lines (via two ISDN B channels) which can be used in parallel. With the adoption of VoIP by consumers, consumer VoIP PBXs have appeared, with PBX functions becoming simple additional software features of consumer-grade routers and switches. Additionally, many telecommunications providers now offer hosted PBX systems where the provider actually hosts the PBX and the phone handsets are connected to it through an internet connection. Open source projects have provided PBX-style features since the 1990s. These projects provide flexibility, features, and programmability. Launched in 1997, IP-PBX took business communication to the next level. IP-PBX is a PBX phone system that uses Internet Protocol (IP) data networks to manage the routing and switching of calls as well as to handle messaging. Virtual hosting resulted in significant cost efficiencies. Apart from offering advanced features (like voicemail), the system could also use a VoIP gateway to connect to traditional PSTN lines. This gave the user the option of continuing with the same carrier. Over time, improvements in the user interface and call quality, along with cost benefits, added to the popularity of IP-PBX among small businesses. DECT – a standard for connecting cordless phones. Internet Protocol – For example, H.323 and SIP. POTS (plain old telephone service) – the common two-wire interface used in most homes. This is cheap and effective, and allows almost any standard phone to be used as an extension. proprietary – the manufacturer has defined a protocol. One can only connect the manufacturer's sets to their PBX, but the benefit is more visible information displayed and/or specific function buttons. DPNSS – for connecting PBXs to trunk lines. Standardized by British Telecom, this usually runs over E1 (E-carrier) physical circuits. Internet Protocol – H.323 and the Session Initiation Protocol (SIP) are IP-based solutions for multimedia sessions. Proprietary protocols – if equipment from several manufacturers is on site, the use of a standard protocol is required. QSIG – for connecting PBXs to each other, usually runs over T1 (T-carrier) or E1 (E-carrier) physical circuits. Internet Protocol – H.323, SIP, MGCP, and Inter-Asterisk eXchange protocols operate over IP and are supported by some network providers. ISDN – the most common digital standard for fixed telephony devices. This can be supplied in either Basic (2-circuit capacity) or Primary (24- or 30-circuit capacity) versions. Most medium to large companies would use Primary ISDN circuits carried on T1 or E1 physical connections. standard POTS (plain old telephone service) lines – the common two-wire interface used in most domestic homes. This is adequate only for smaller systems, and can suffer from not being able to detect incoming calls when trying to make an outbound call (commonly called glare). File – the PBX generates a file containing the call records from the PBX. Network port (listen mode) – an external application connects to the TCP or UDP port. The PBX streams information to the application. Network port (server mode) – the PBX connects to another application or buffer. Serial interface – historically used to print every call record to a serial printer. In modern systems a software application connects via serial cable to this port. A data record from a PBX or other telecommunication system that provides the statistics for a telephone call is usually termed a call detail record (CDR) or a Station Messaging Detail Record (SMDR). Virtual PBX systems or hosted PBX systems deliver PBX functionality as a service, available over the public switched telephone network (PSTN) or the Internet. Hosted PBXs are typically provided by a telephone company or service provider, using equipment located in the premises of a telephone exchange or the provider's data center. This means the customer does not need to buy or install PBX equipment. Generally the service is provided by a lease agreement and the provider can, in some configurations, use the same switching equipment to service multiple hosted PBX customers. The first hosted PBX services were feature-rich compared to most premises-based systems of the time. Some PBX functions, such as follow-me calling, appeared in a hosted service before they became available in hardware PBX equipment. Since introduction, updates and new offerings have moved feature sets in both directions. It is possible to get hosted PBX services that include feature sets from minimal functionality to advanced feature combinations. The ongoing migration of most major telecommunication carriers to IP-based networks, coupled with the rise in Cloud Communications has resulted in a significant rise in the uptake of hosted PBX solutions. A mobile PBX may exploit the functionality available in smartphones to run custom applications to implement the PBX specific functionality. In addition, a mobile PBX may create extension identifiers for each handset that allow to dial other cell phones in the PBX via their extension shortcut, instead of a PSTN number. An IP PBX handles voice signals over Internet protocol, bringing benefits for computer telephony integration (CTI). An IP-PBX can exist as physical hardware, or can carry out its functions virtually, performing the call-routing activities of the traditional PBX or key system as a software system. The virtual version is also called a "Soft PBX". ^ Ng, John (June 16, 1986). "Fish, Fowl, or Neither? : Quick, what's the difference between a key telephone system and a hybrid?". Network World. 3 (15). ^ "Big Changes Coming for SMBs in 2014 (Infographic)". eFax. 17 December 2013. Retrieved 23 February 2014. ^ "BT Prepare to Switch to an All IP Network by 2025". Yoozoom Telecommunications. Yoozoom Telecommunications. Retrieved 8 October 2015. ^ Sullivan, Mark. "The Big Guide To VOIP For Small Business". Forbes.com. Retrieved 23 April 2014. ^ Carter, Fredrick. "All the World's a Stage; So Start Performing!". Retrieved 24 August 2017. ^ Unuth, Nadeem. "The Functions of a PBX". About.com. Retrieved 23 February 2014. ^ Wright, Ian. "Features of a Business Phone System". Expert Market. Retrieved 23 April 2014. ^ "Why Hosted PBX is the Better Choice For Small Businesses". Unity Connected Solutions. Unity Connected. ^ "On-Premise [sic] vs Hosted PBX: Blockbuster or Netflix? - Blog - 1stel". Blog - 1stel. 2016-03-01. Retrieved 2016-05-02.